Demonstrating an environmental sensitivity unparalleled elsewhere, Costa Ricans have set aside one quarter of their land as protected areas and national parks. Ecotourists are rewarded with botanical and animal marvels found nowhere else on Earth. Although Costa Rica is best known as an invaluable refuge for nature, this small nation is also a haven of peace. Costa Rica is the penultimate link in a chain of small nations that together comprise the isthmus of Central America. Along with the Caribbean and the Pacific, the country's borders are defined by Nicaragua to the North and Panama to the South. Located at the nexus of two continents and two oceans, this confluence of land and water makes the region one of mother nature's great bottlenecks. Here, geography constricts a breathtaking amount of plant and animal life within a modest 19,563 square miles (50,900 sq. km), an area comparable in size to Denmark or West Virginia. Within this diminutive nation is found an astonishing five percent of the world's biodiversity, including more than 800 species of ferns, 1,000 of orchids, 2,000 kinds of trees, and 200 species of mammals. Both coastlines of Costa Rica have an abundance of beaches, though the Pacific strands are generally both less developed and less spacious. Between the coasts, the interior of the country is shaped by four cordilleras, or mountain ranges, which run from North to South. The capital, San Jose, rests roughly in the nation's center, settled within a highland valley. Cascading down to the Caribbean from the central mountains are Costa Rica's many great rivers, including the Reventazon. The Pacific side is marked by two broad peninsulas that hook out into the Pacific, the Nicoya and the Osa. It is a geographic curiosity that their shapes are almost identical, the Osa being a smaller rendition of the Nicoya. Costa Rica's climate is renowned as an atmospheric treat. Mild subtropical conditions prevail year-round, and discomforting temperature extremes and prolonged periods of gray are practically nonexistent. Temperature varies mainly according to elevation, the higher the cooler. The brunt of the rainy season lasts from May through November, while a brief dry spell pays a visit from February to April. 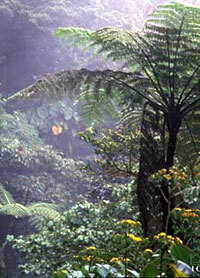 Costa Rica's rain falls mainly on the Caribbean coast, giving the Pacific a much more arid climate. Copyright (c) 1998-2006 interKnowledge Corp. All rights reserved.